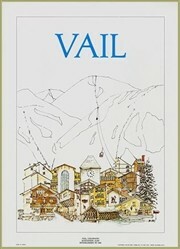 Available in three sizes: 20 x 30 in., 24 x 36 in., 30 x 40 inches. 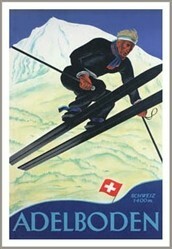 The Adelboden Swiss ski poster celebrates the invention of extreme skiing. Thanks to advancements in ski technology, skiers are able to perform unimaginable tricks. Daredevils of the past, were inventing the art of air, on 50 pound skis, with non release bindings, a seriously deadly combination. 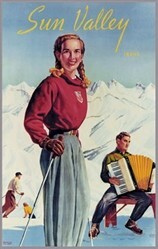 Adelboden offers many ski runs of all degrees of difficulty, including the world-cup giant slalom run on the Kuonisbärgli, and cross-country ski trails.